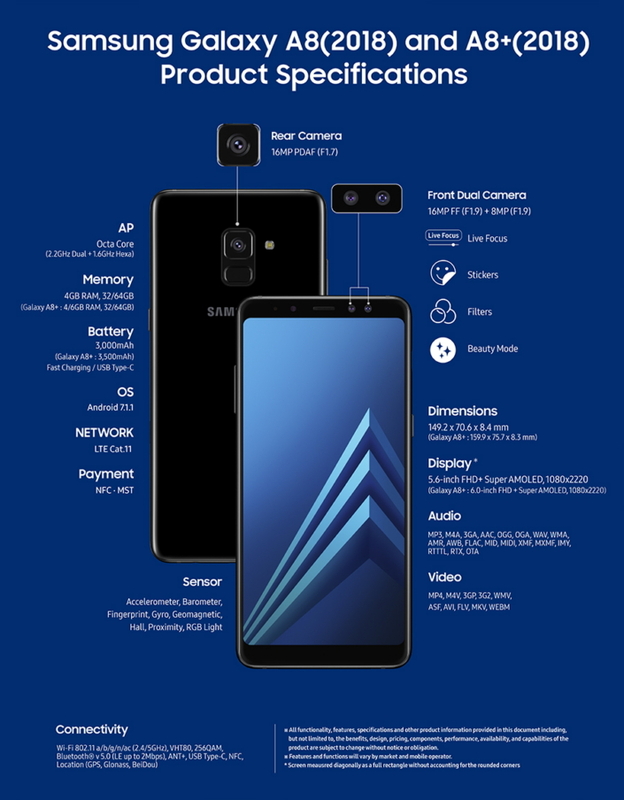 Samsung Galaxy A8 (2018) and the Galaxy A8+ (2018) have been announced today with dual front cameras and Infinity displays, similar to what we have seen on Samsung’s high-end Galaxy S and Note series. Both devices closely inspired by the Samsung Galaxy S8 and Galaxy S8+. The announcement confirms an 18.5:9 aspect ratio display on the phones. Additionally, these Samsung Galaxy A series devices will be the first to feature dual selfie cameras. The Samsung Galaxy A8 and Galaxy A8+ were earlier speculated to launch in early 2018., succeeding the Samsung Galaxy A5 and Galaxy A7 from last year. The Samsung Galaxy A8 (2018) comes with a 5.6-inch display and the A8+ (2018) with a 6-inch panel. Both the phones feature Infinity displays with an 18.5:9 aspect ratio. In terms of optics, the devices are coming with Dual selfie cameras from Samsung. The Samsung Galaxy A8 will come with a 16MP + 8MP dual selfie cameras. A 16MP rear camera adores the back with a bright f/1.7 aperture. The fingerprint sensor is also optimally placed below the camera. Both the phones also support the Samsung Pay and get NFC as well as MST modes of payment. Samsung has also included fast charging support via USB Type-C port and IP68 water and dust resistance just like the Galaxy S8. Coming to hardware, the Samsung Galaxy A8 (2018) and Galaxy A8+ (2018) come with an Octa-core processor. You get 4GB RAM and 32GB/64GB storage on the Galaxy A8 (2018) and 4GB/6GB RAM with 32GB/64GB internal storage on the Galaxy A8+ (2018). The devices will run Android 7.1.1 Nougat out-of-the-box. This is slightly disappointing as the other Samsung handsets are now getting Android 8.0 Oreo update. Both the Galaxy A8 (2018) and Galaxy A8+ (2018) are expected to launch in January next year. There are rumours of the phones being priced at €499 (Rs. 37,700) for the Galaxy A8 and €599 (Rs. 45,300) for the Galaxy A8+. The pricing puts these in the mid-range offering from Samsung.